You can come up with some really cool effects using brushes to mask with, and it’s really easy. 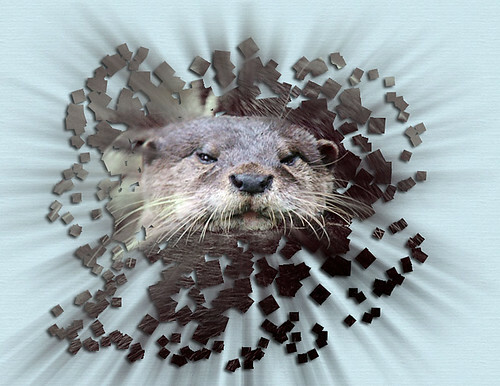 We will be using the noisy otter image below to try this out on, just click on the image to go to a larger version. The larger image is 800 x 600 @72dpi, so the settings I use in the brush engine etc., will be different on a higher res image. With your image open, double click on it and either accept the default Layer 0 or name it something. 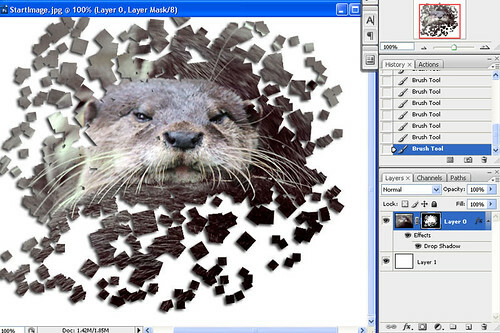 Then I want you to hold down the Ctrl Key and click on the new layer icon at the bottom of the layers palette. This will place the new layer below the original layer. You can go ahead and fill the new layer with a colour of your choice, I’ve chosen white but you change the colour later if you want anyway. 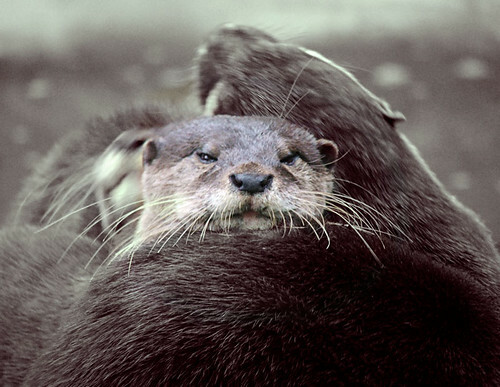 You are now going to put a layer mask on the original otter layer. 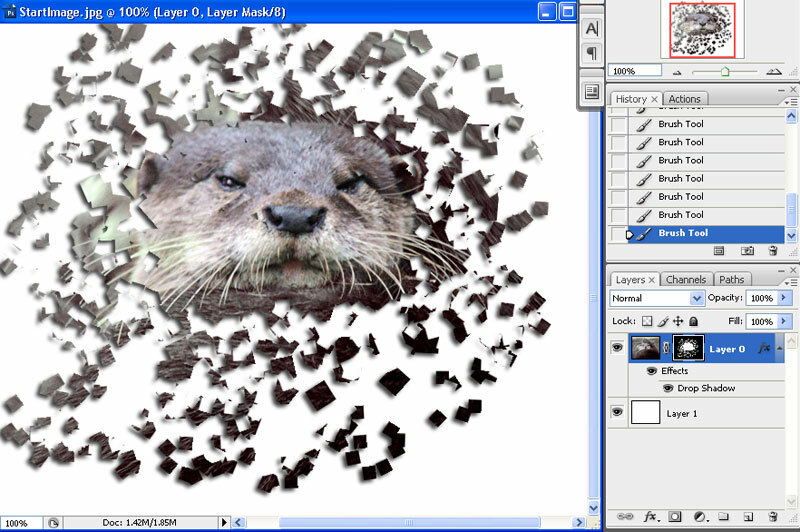 Make sure that the layer is active by clicking on it, and then hold down your Alt/Option Key and click on the Add Layer Mask icon at the bottom of the layers palette. You should now have an image similar to the one below …… depending on what colour you choose for the new layer you created earlier. Holding down the Alt (PC) Option (Mac) makes the mask Hide All ….. White Reveals – Black Conceals, is a good way to remember how masks work. Now you need to get a brush to do the effect with. Remember that none of this is restricted to the brush that I am going to choose. In fact, it isn’t restricted to using brushes either. You will be presented with a small dialogue box that gives you some options, I usually choose append. You are going to change some of the settings for the brush, so you need to bring the brush engine/palette back up again. 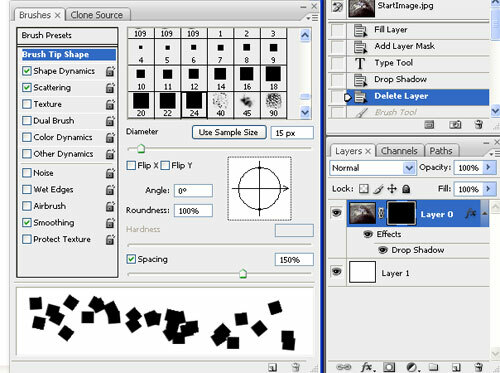 Make sure you have the brush tool selected in the toolbar before you go into the brush engine. If you appended the brushes, the square brushes will be at the bottom, so scroll down and pick the largest one …. probably about 24. You can change the size later when you are working on the image by using the square bracket keys on your keyboard. These are the settings that I used to test the brush – feel free to go back in at any time and change them for a different effect. You should end up with something similar to the engine below. Remember that you can go back in the brush engine at anytime and change the settings to suit yourself. You can close the brush engine now. 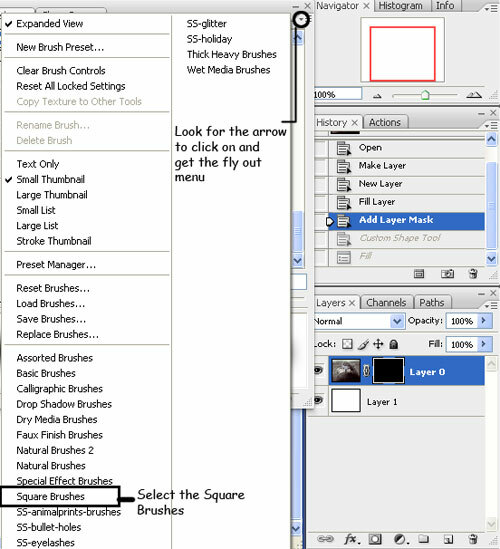 Next, before you do anything with your newly made brush, I want you to double click on the image itself to bring up the Layer Styles palette, choose drop shadow and accept the default settings. You can always go back in and change this later if you want. Make sure that the brush tool is selected and your square brush is selected (which it still should be), make sure that your f/ground colour is white (to reveal), click on the layer mask to make sure you are painting on it and go ahead and reveal the otter’s face with your brush. You can reduce the size of your brush as you move out from the face if you want. Simply press the left square bracket key(located near the P key on your keyboard) to reduce the brush tip size. If you want to enlarge it again press the right bracket key. You might end up with an image similar to the one below. The beauty of using masks of course, is that by simply switching your f/ground colour (to black in this case) you can take away some of the squares that you revealed in the image. Essentially breaking them up a bit. 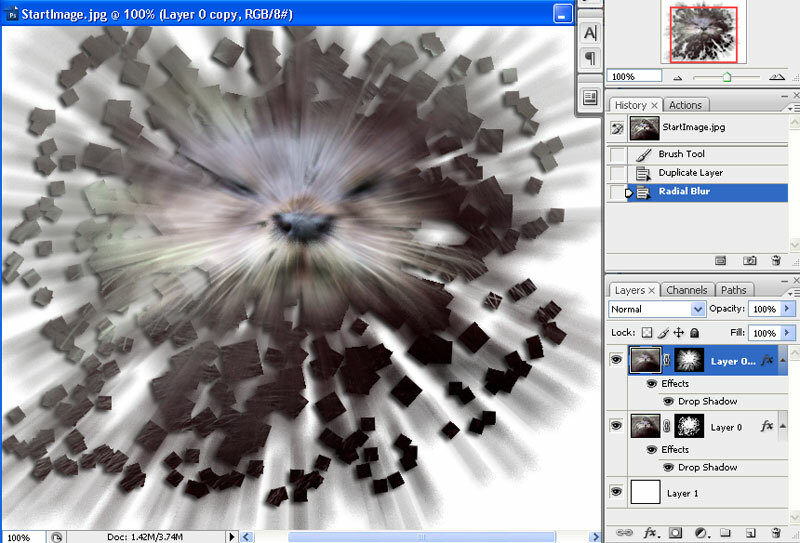 What you can do now is duplicate the layer you were just working on and then go to Filter>Blur>Radial Blur. I chose 75% – Zoom. Because the Radial Blur doesn’t have a preview window, you will have to manually place where the centre of the blur will be coming from. 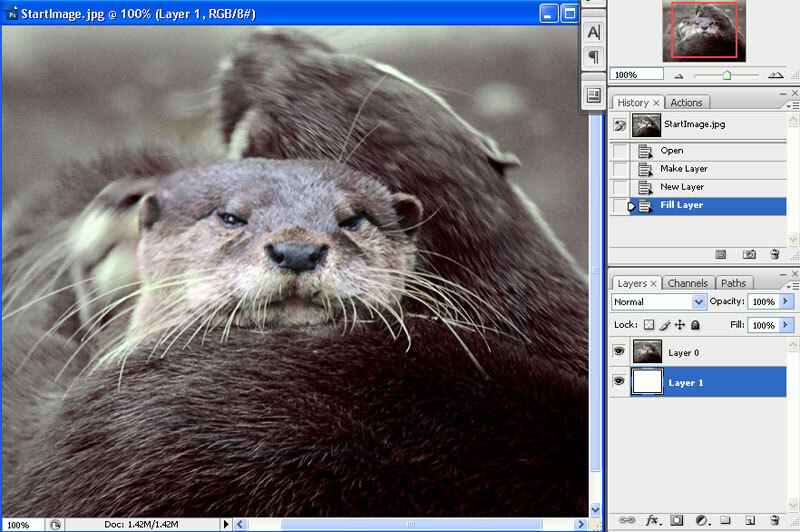 Working on the layer mask of the newly blurred image, and making sure the f/ground colour is set to black, go ahead and paint back in the otter’s face – reduce the size of your brush on occasion and go to the outer edges of the image as well. You can go back to the previous layer mask as well if you feel something has to be added back in to the image. What I’ve done on the final image below is repeat the radial blur effect on Layer 0 copy layer – Filled the b/ground with the Aqua Pattern by going to Edit>Fill and choosing pattern from the drop down menu. As I said at the beginning, this wasn’t really the best image to show this effect ……. also, don’t feel that you are stuck with using a square brush either, go and experiment with a few different things and see what you come up with. Added by admin on November 29, 2008.